Ex–Special Forces member McNab (Last Light, 2002, etc. ), back in a fifth outing, continues his career of vicarious mayhem. It’s one last assassination for British ex-pat, Bond-heir apparent, superspy-assassin Nick Stone—who doesn’t know why the Algerian convenience-store king Zeralda needs to die and doesn’t really care. After all, he’s a “K” who works on deniable missions for the Intelligence Service, and “I’d always tried to turn my back on the guilt, remorse, and self-doubt that always followed a job.” Nick brings Zeralda’s head home and doesn’t say a word. Will he now be able to put all that behind him and become a barman or a tour guide, get his US citizenship, and please the two women in his life, the love interest and the semi-estranged daughter? Fugeddaboudit. It takes only the knowledge that Zeralda was mixed up with Al Qaeda (not to mention little boys) to bring our hero back to action tout de suite (“Today was the day the covert three-man team I commanded was about to take the war to Al Qaeda”). He vaults back into his world of intrigue and gadgetry, working with men who are used to jabbering in Arabic on the Net (but he’ll manage) and encountering characters with names like Hubba Hubba, Leather Girl, and Goatee. And when the mission’s all over, the dirty bomb thwarted, etc., Hubba Hubba is quick to remind Nick that he wouldn’t want to be a barman anyway, and superspies were sort of a family, weren’t they? “I couldn’t be a student or a bartender,” Nick concedes. “I couldn’t do anything other than what I did.” McNab may be slipping a bit here in trying to churn out product to match the times: it’s up-to-date enough to refer to Mr. And Mrs. B. entertaining heads of state with Tex-Mex while bombs fall in Afghanistan. 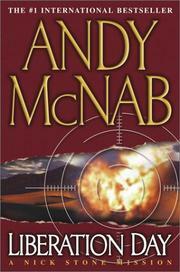 Still, McNab is as obsessed with detail as always. Another franchise in the Nick Stone industry.